Fortunately for parents everywhere, now kids have the iPad to channel their inner artists. There are plenty of nice drawing apps out there that inspire kids to be creative, and today I’ll be showing you two of them: Pirate Scribblebeard’s Treasure and Princess Drawsalot and the Dragon. Part of Oscar & Josephine app series from Kidoodle and Fingerprint, Pirate Scribblebeard’s Treasure and Princess Drawsalot and the Dragon are digital activity apps that combine thematic doodle books with the interactivity of iPad. The idea is that your kids join Oscar and Josephine on their adventures, with their drawings becoming part of the story. Much like Sago Mini Doodlecast, each page comes with a partially drawn doodle and an accompanying narration/prompt delivered by cute pop-up paper cut-out characters, e.g. “I am Pirate Josephine and I need two burly pirates for my crew” or “Indeed, a truly magical wizard’s cap“. Kids are free to complete the doodle any way they like -- they can make it realistic or completely silly. Once the drawing is finished, it is a matter of tapping the next/previous arrows at the bottom of the page and the scene will come to life with animations and sound effects, your kids’ drawings included. The app then moves on to the next page, and the process is repeated until kids get a book filled with their drawings. As one might expect, Pirate Scribblebeard’s Treasure features a pirate theme. Thus, the instructions are along the lines of creating a pirate flag, making up a pirate snowman, and imagining what is inside a treasure chest. On the other hand, Princess Drawsalot and the Dragon features a medieval tale filled with, well, princesses and dragons. 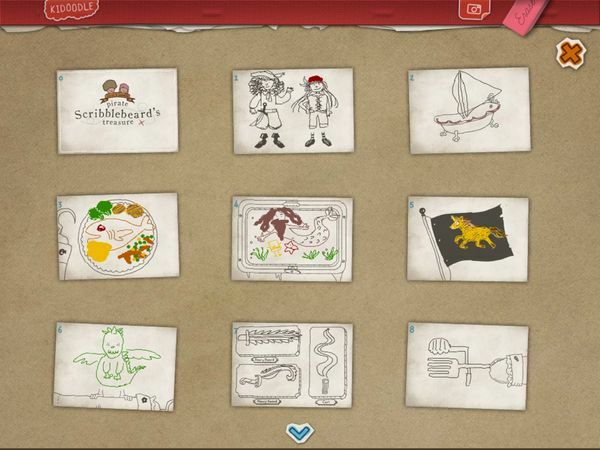 The creative tasks found in this app includes coming up with a wanted poster for a pastry-stealing dragon, designing the queen’s crown, and brewing up a potion for locating the doodle dragon’s cave. As of the time of this review, Pirate Scribblebeard’s Treasure has 19 pages and Princess Drawsalot and the Dragon has 15. The developer plans to add more pages in the future as free updates for those who have purchased the apps. Pirate Scribblebeard’s Treasure and Princess Drawsalot and the Dragon are suitable for juniors ages 3+. The apps are intuitive and easy to navigate, and there are animated tutorials as well as clear instructions to guide juniors as they play. Both Pirate Scribblebeard’s Treasure and Princess Drawsalot and the Dragon are part of Fingerprint Network, which connects a number of educational apps for kids. The platform has features that allow parents to track their juniors’ progress in the apps, as well as find other apps curated by the network. More information about the network is available on their website. I like how the doodle books from Kidoodle come with backstories that spark the kids’ imagination and creativity. Most kids naturally create stories as they draw anyway, so these apps accommodate the process really well. I like how juniors are provided with partial drawings to build on instead of a blank canvas; it is useful for overcoming the fear of blank canvases. The list of prompts are quite silly, yet appropriate for kids. The app also has plenty of good humor, e.g. at one point kids are asked to create a sea monster from a banana in Scribblebeard, and to draw a whole family of eccentric dragons in Drawsalot. The funny animations, sound effects, and dialogs further enhance the imaginative atmosphere. One improvement that I would like to see is more color choices. Currently, the apps only have 8 choice in their palettes -- it is not bad, but I think kids could benefit from having a few more colors at their disposal. Pirate Scribblebeard’s Treasure and Princess Drawsalot and the Dragon are fantastic drawing apps that inspire imaginative thinking. Kids (or adults) can have a lot of fun with the app creating silly illustrations and stories. Both apps have great production values, featuring beautiful, paper-like graphics as well as smooth animations. I would highly recommend them if you are looking for creative apps for your juniors. Apps were provided for our honest review.